Reykjavik (and by extension Iceland) was an absolute treasure from beginning to end, and will remain as the highlight among the numerous other highlights of our holiday. Did you know that Iceland has a 100% literacy rate? Or that it has a population of only 330,000 people? Or that 1 in 10 Icelanders are published authors? 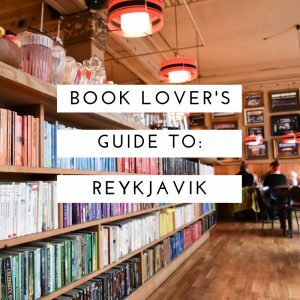 Well it’s true, and below is just the briefest snapshot of our favourite bookish locations in the capital city of Reykjavik. The Laundromat Café is an odd mix of laundromat-themed memorabilia (obviously), and book-themed décor. While it does seem off-putting to see posters and photos of laundromats adorned upon book cover wallpaper, to us it feels like they pulled it off, and the rows of book spines (or possibly actual books, we weren’t able to check!) under the bar were a great touch. 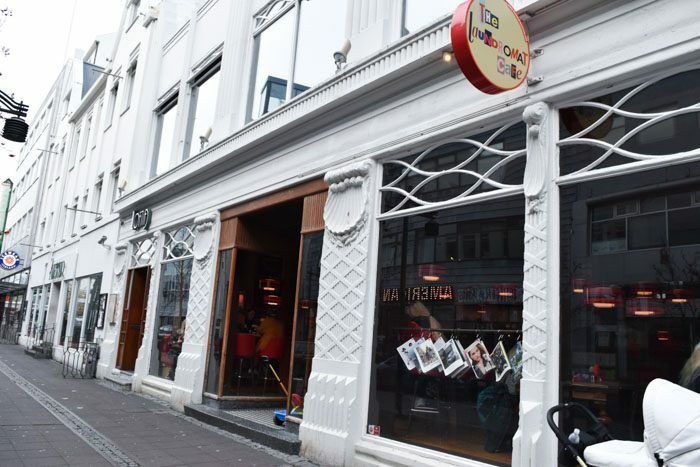 The menu is typical café/diner fare, and they provide a range of magazines, newspapers, and even board games to play with others! X-Factor: Downstairs next to the actual laundromat (did we mention there’s an actual laundromat here? Seems obvious in hindsight considering the name, but we were surprised when we saw it!) is a reading room with little booths tucked into the wall and a play area for the kids. 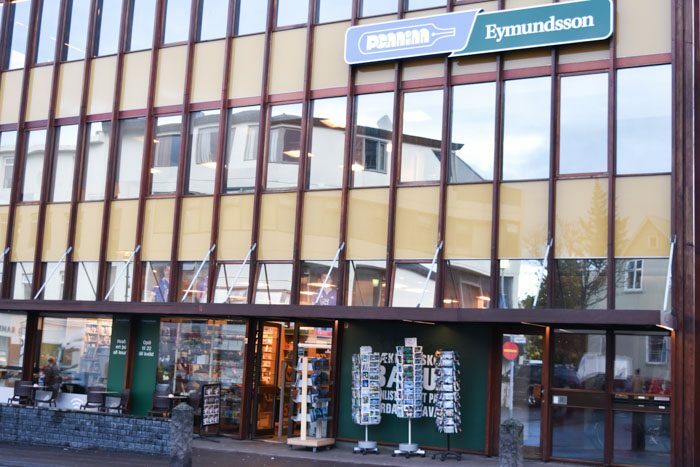 We managed to fit in two visits to two different Eymundsson stores during our brief stay in Reykjavik. We decided to combine both into the one entry due to our similar they are in terms of décor, design and content. 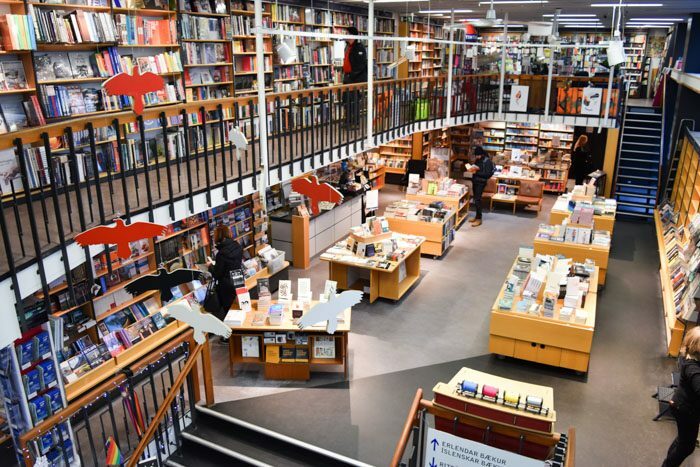 Eymundsson is a chain bookstore situated in the heart of the capital city, and during our visit they had a large selection of merchandise such as tote bags and mugs, in addition to their great range of Icelandic crime fiction. 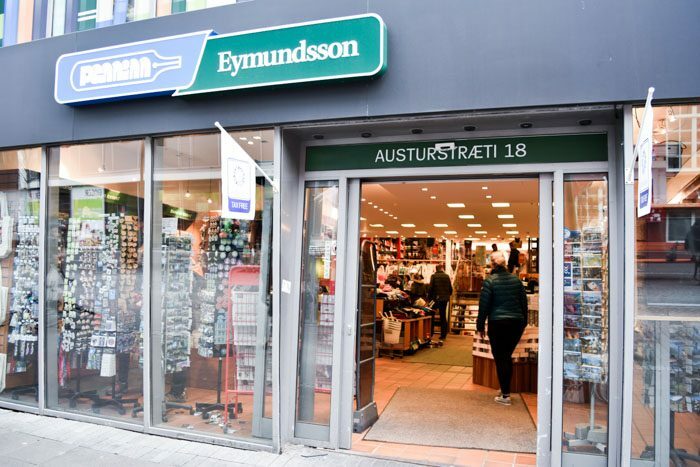 X-Factor: It seems like every Eymundsson store is bundled with a café, so expect to be given the opportunity to rest your legs and nurse a warm mug of your drink of choice as you escape the cold. 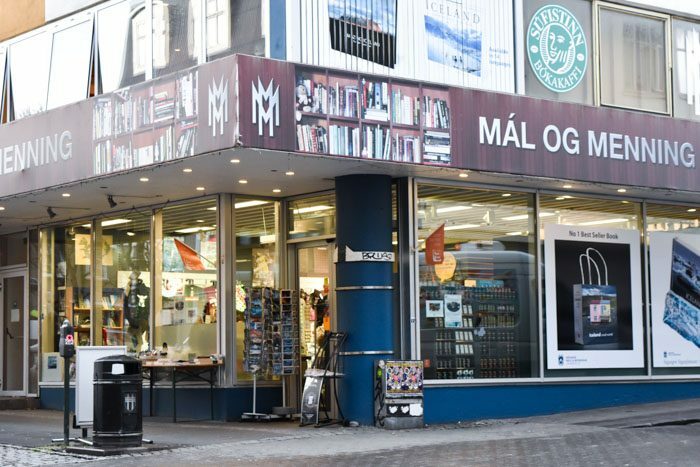 A beautiful bookstore spanning three levels, Mal Og Menning offers a huge range of English books in a variety of genres. Its open layout made browsing a pleasure, and it also offered an English bargain table in the back corner- see if you can find it! X-Factor: Their travel section was simply inspiring and contained a massive range of guide books for every country you could think of. 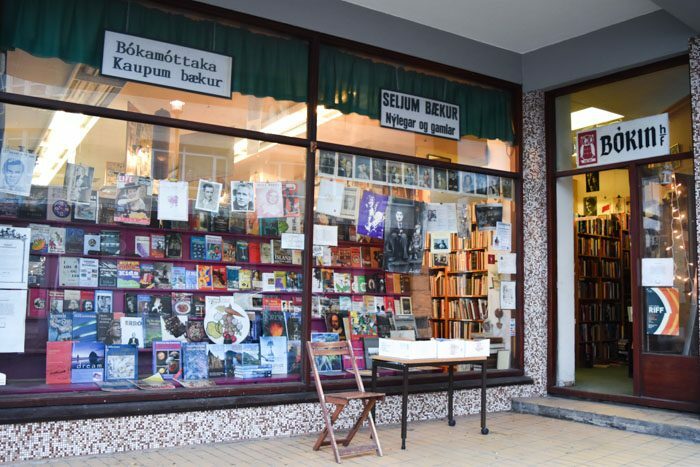 In direct contrast to the giant bookstore above, Bókavarðan (Bokin) is a small, cozy second-hand book seller overflowing with all manner of weird and wonderful books. 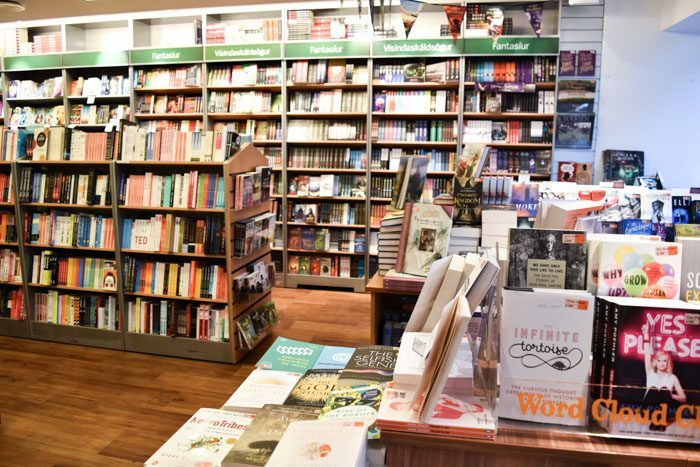 While most of the books are in Icelandic, keep an eye out for sections of bookshelves stacked with German, English or French. 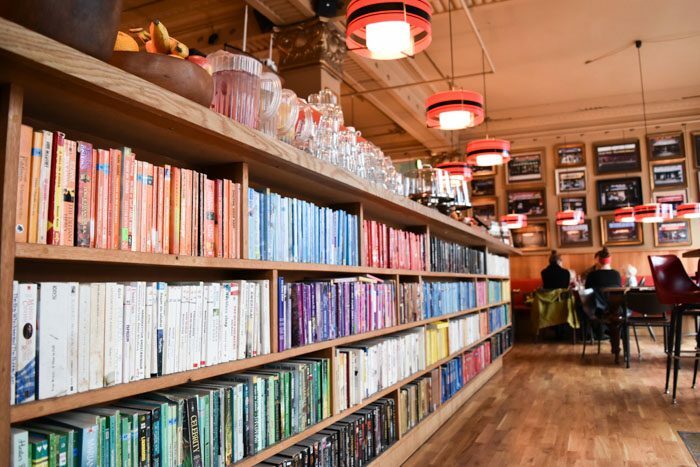 X-Factor: Buried somewhere within this bookish maze is a set of shelves organised by colour. See if you can find the rainbow! 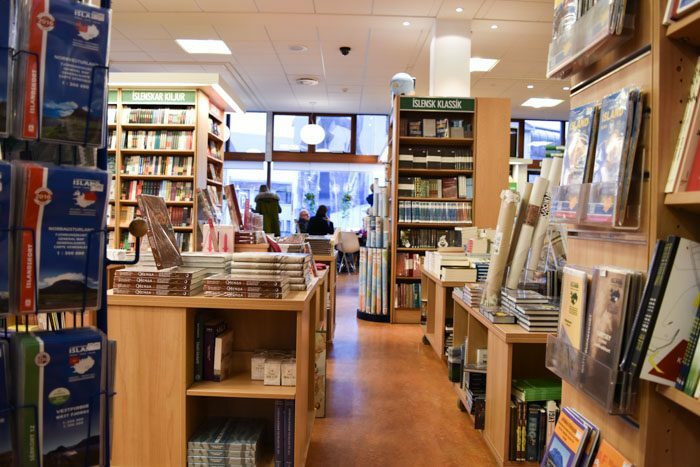 A cosy bookstore café in central Reykjavik, the central theme of this store appears to be gifts and souvenirs but with a good range of Icelandic literature translated to English. The store itself is a joy to be in, with wooden floors and exposed beams lending it a very trendy, relaxing vibe. X-Factor: The delicious cakes on display! Make sure you try one! A large modern building close to the harbour, the library is a perfect place to escape the cold. Lots of couches and reading corners means you’re spoiled for choice in finding a spot to call your own for an hour or few. As a bonus, there are bean bags in the YA section, as well as a special children’s area. Fellow Anglophones do not fret, for the library boasts a huge range of English books, including new releases in the foyer and in the YA section. X-Factor: A great selection of English-language comics divided by theme. We especially loved the ‘women/female protagonist’ section! Right, well it’s time to pack our bags and get ready for our next destination, and it’s a big one. Paris is up next, and in a city with such a rich history, I’m certain it won’t disappoint!